Juventus midfielder Paul Pogba was approached by "very important clubs" this summer, the Italian club's chief executive has confirmed. Pogba, 22, was linked with Chelsea and Manchester City in the transfer window. The France international could soon be worth 100m euros (£73m), Giuseppe Marotta told a news conference. "As we want to win, we have decided to keep hold of a player as important as Pogba, although we have had offers," he added. 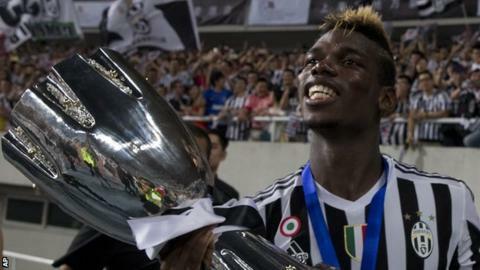 Former Manchester United youngster Pogba left Old Trafford to join the Italian champions - Serie A winners for the past four seasons - in 2012. He helped them to reach the final of the Champions League last season, where they were beaten 3-1 by Barcelona. Though the Turin club kept Pogba, they lost Chile forward Arturo Vidal and Argentina striker Carlos Tevez in the summer, while they agreed to end Italy midfielder Andrea Pirlo's contract a year early so he could join New York City in the USA. Marotta was also critical of German club Schalke after Juve failed to sign midfielder Julian Draxler from the Bundesliga club. "There has been a difficult dialogue with Schalke, who are a mysterious club," he said. "They made a disproportionate request - 36 million euros is an exaggeration and there was also the lack of interest from the player."